A question I get on almost a daily basis is, "what is the best Medicare Supplement Plan?". That questions has to be answered in a case by case basis, not all people have the same needs and budget. As a general rule, at this time, I believe the Medicare Supplement Plan G gives the most benefits for your premium dollar. Keep reading for the facts about Medigap Plan G, to compare rates just enter your zip code on the quote tool on this page or call us at 844-528-8688. When it comes to a combination of benefits and low premium, at this time, you have look at the Medicare Supplement Plan G. The most popular plan for many years was a Plan F, but as people realized that it was actually cheaper to pay the part B deductible out of pocket, the Plan G has started to rise in popularity. 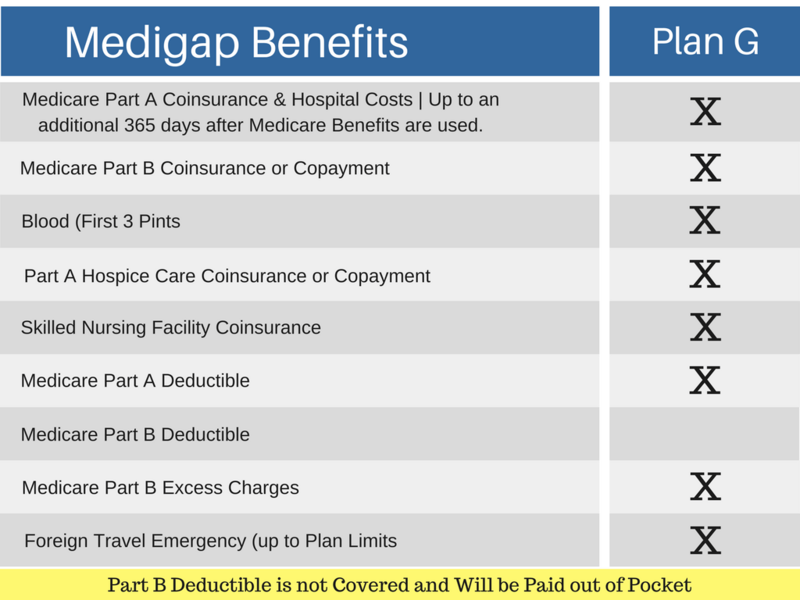 Once you pay the part B deductible ($183.00 at this time), your benefits will be identical to a Medicare Supplement Plan F, that is really the only difference. See chart below for a side by side comparison. Some of the biggest expenses that can be incurred have to do with hospitalization, and the Medigap Plan G covers those in full. Both the Medicare Part A deductible and the Part A coinsurance are covered, just like a Plan F.
The coverage for the Medicare Part A deductible is especially important to be covered, because unlike the Part B deductible, it is not a yearly deductible. The part A deductible is per benefit period which is calculate from the first day of inpatient care and ends when you have not received inpatient or skilled care for 60 consecutive days. So realistically you could have a deductible every 90 days, improbable but could happen. The annual cost of a Medigap Plan G, is typically $300.00 to $400.00 less than the Medicare Supplement Plan F. So even after you subtract out the Part B deductible you are still saving a few hundred dollars per year. Aside from the lower Medicare Supplement premiums, historically the rate increases for the Medicare Supplement Plan G have been significantly lower than the increases for the Plan F.
What yet needs to be seen in what results the ending of the Medicare Supplement Plan F will have on the supplemental plan G rate increases, but we do not have a crystal ball. My guess is that all of the new people going into Plan G should keep the rate hikes low, but time will tell. The cost of the 2018 Part B deductible is $183.00, this deductible is set by Medicare and could change and has in the past. The Medicare Supplement company has no control over the part b deductible. This cost has been stable for the last few years, it can be increased, but even if it does this deductible is for the doctors or part B services only. The fact that you are paying it out of pocket and that the Medicare Supplemental Provider does not incur any cost associated with it, an increase should not affect your premium on your Medicare Supplement Plan. When you are choosing a Medicare Supplement plan, there is much more you need to look at than just the monthly premium amount. While I understand the need to budget, looking at just the monthly premium for your Medicare Supplement is short sighted. What might be the lowest priced today, might have very large rate increases down the road. Some companies will come into the market and offer "rock bottom" prices to basically buy new business. The above method many times ends up with a very large or above normal rate increase a year or two down the road as the company tries to recover from the loss. While I do carry some smaller carriers for people that are only concerned with the lowest premiums, I prefer to go with a larger more stable Medicare Supplement Provider. The reasons for this, is that a larger carrier tends to have more capital and can adjust to some expense volatility better than the smaller carriers. It is not that there is anything wrong or risky with the smaller Medicare Supplement Plan G providers, it is just that they have some vulnerability to being bought out or larger rate increases if Medicare raises the costs. Truth be told, the smaller Medicare supplement providers are re-insured by the big boys in the game. You would be surprised to know that most of the large household names are actually covering the backs of the smaller companies in the market. What is the best Medicare Supplement Plan? It comes down to, what are your needs and budget. 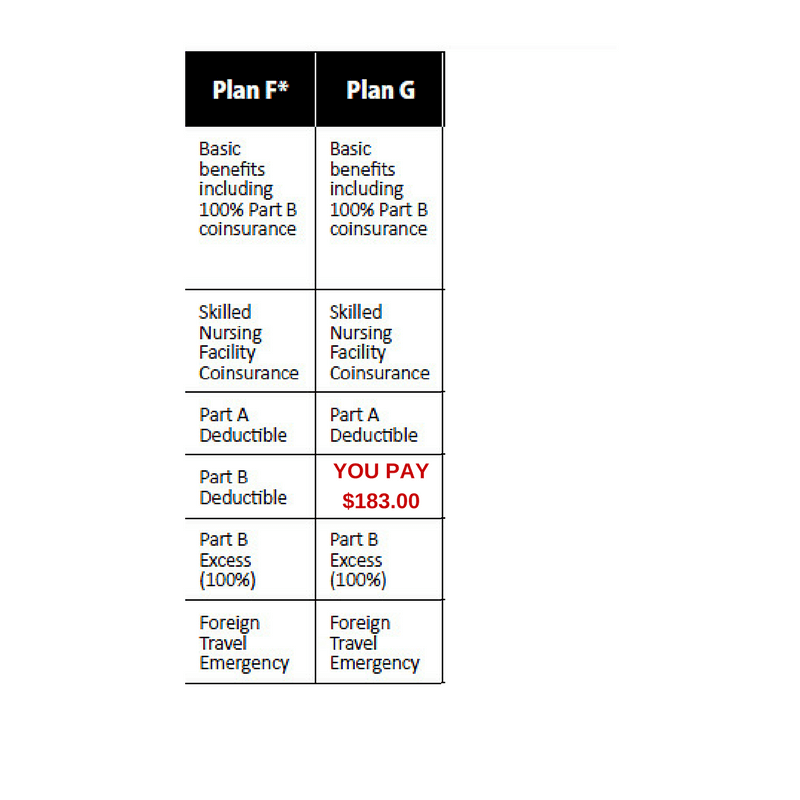 For the majority of people the Plan G with cover all of their needs at an acceptable cost. To discuss what Medicare Supplement Plan is the right fit for you, please call us for a completely free no obligation consultation at 844-528-8688. As an independent broker our loyalty is to you not the insurance company. We carry all the top providers of Medicare Supplemental Insurance in 43 states and there is never a fee for our services. If you prefer to start by email, just fill out the form on our contact us page.